Missouri lawmakers return to the Statehouse in Jefferson City on Wednesday for the 2016 veto session. The House and Senate will gavel-in at noon on Wednesday. Governor Jay Nixon (D) vetoed 23 bills this year, but three of them occurred during the regular session. Two of those were overridden and one was sustained. Lawmakers will consider the remaining 20 bills on Wednesday. ** photo ID: State Sen. Will Kraus (R-Lee’s Summit) told Missourinet late Monday afternoon that he believes the Legislature has enough votes to override Governor Nixon’s veto of a bill that would require a photo ID to vote. Governor Nixon wants lawmakers to sustain his veto. “I’ve always been in favor of involving more people in voting, and putting up barriers to keep them from voting I don’t think is a good idea. This would disproportionately impact senior citizens, those with disabilities and others who have been lawfully voting,” Nixon told reporters in Jefferson City last week. The Missouri House and Senate approved the voter ID bill in May, with veto-proof majorities in both chambers. Kraus and other Republicans say the measure would protect against voter fraud. ** Comprehensive gun legislation. Nixon vetoed the bill this summer and wants lawmakers to sustain his veto. The Governor says the bill eliminates any training requirement for a permit. “I’ve signed bills to expand the rights of law-abiding Missourians to carry conceal. I’m always willing to consider ways to further improve that CCW process, but I cannot support the extreme step of throwing out that process entirely, eliminating sensible protections like training requirements and background checks and taking away the ability of Sheriffs to protect our communities,” Nixon says. Nixon also says the bill would allow individuals to legally carry a concealed firearm, even though they have been denied a permit because their background check revealed criminal offenses or caused the Sheriff to believe they posed a danger. The bill sponsor, State Sen. Brian Munzlinger (R-Williamstown) says his bill would allow law-abiding Missourians to protect themselves. 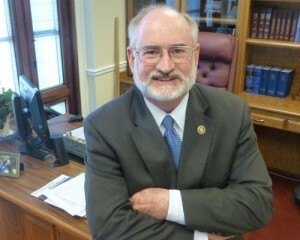 Munzlinger’s bill has numerous provisions, including a lifetime concealed carry permit and concealed carry permit fees. It would expand Missouri’s “castle doctrine,” which allows homeowners to use deadly force against intruders by letting guests to also use such force. The measure also includes a “stand your ground” provision to let people in a place they were legally allowed to use deadly force against a perceived threat, without retreating. ** Ag legislation involving disasters. This is a key issue for the Missouri Cattlemen’s Association. State Sen. Dave Schatz (R-Sullivan) will lead Wednesday’s effort to override Governor Nixon’s veto of a bill creating an income tax deduction for payments received as part of a program to compensate ag producers who suffer losses due to disasters or emergencies. While Governor Nixon estimates the bill’s fiscal impact at about $51 million, Schatz says he believes the number is about $12 million, citing a University of Missouri study. In his June 28 veto message, Nixon said he could not support exempting the payments for income tax purposes and “certainly not doing so retroactively”. Under Schatz’s bill, the deduction would be available for all tax years beginning on or after January 1, 2014. ** a bill allowing MODOT workers and contractors to display red and blue lights in work zones. Governor Nixon vetoed the bill this summer, saying red and blue lights are used by emergency vehicles and that permitting transportation vehicles to display them “will cause motorists needless confusion.” Nixon did sign legislation allowing transportation vehicles to display amber and white lights. The House sponsor, State Rep. Charlie Davis (R-Webb City), says his bill allows MODOT to do a pilot program. Davis tells Missourinet he disagrees with the Governor’s safety concerns about platooning, adding that he plans to seek an override. Republicans control the Missouri Senate 24-7 and the House 114-45-1, both veto-proof majorities. Overrides require a two-thirds vote in both chambers: 109 votes in the House and 23 in the Senate. The Missouri Constitution allows up to ten days for the veto session. However, House Speaker Pro Tem Denny Hoskins (R-Warrensburg) tells Missourinet he’s hopeful lawmakers can complete their work on Wednesday.